A came to Ludlow tower. That fills an English grave. And valour so hath sped? “Night was nearly gone. All slept in the beautiful bright city of Osaka. The harsh cry of the sentinels, calling one to another on the ramparts, broke the silence, unruffled otherwise save for the distant murmur of the sea as it swept into the bay. Above the great dark mass formed by the palace and gardens of the Shogun a star was fading slowly. Dawn trembled in the air, and the tree-tops were more plainly outlined against the sky, which grew bluer every moment. Soon a pale glimmer touched the highest branches, slipped between the boughs and their leaves, and filtered downward to the ground. Then, in the gardens of the Prince, alleys thick with brambles displayed their dim perspective; the grass resumed its emerald hue; a tuft of poppies renewed the splendor of its sumptuous flowers, and a snowy flight of steps was faintly visible through the mist, down a distant avenue. 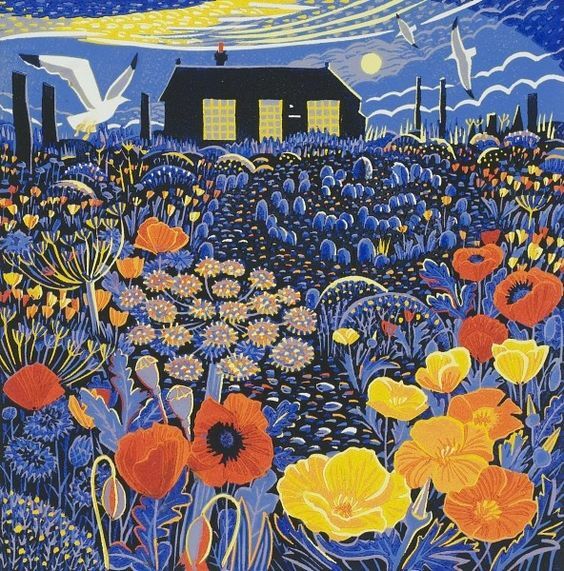 ‘Poppyland’- Furnishing Fabric by Liberty & Co. Ltd.
A wonderful collection as ever, Jane. The wild poppies in my garden may have come and gone, but your post is a lovely reminder of their vibrancy and colour. 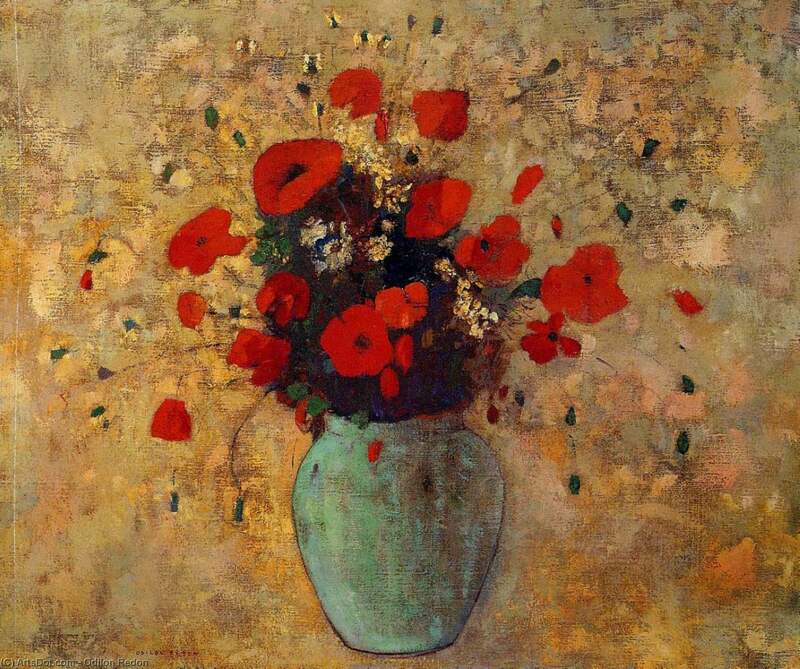 That painting by Redon is particular beautiful. Really lovely Jane! 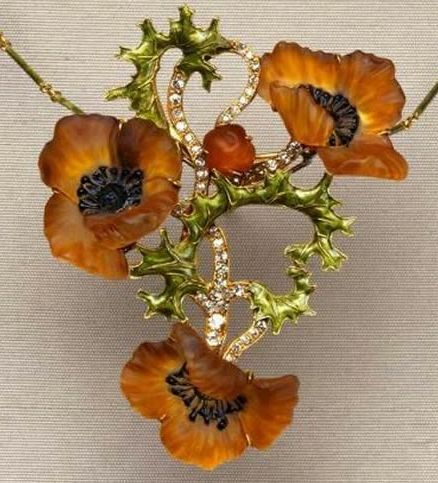 How would anyone have the courage to wear a Lalique glass pendant? I fear I would have it smashed to smithereens before I even left the house! Thank you for this lovely collection! 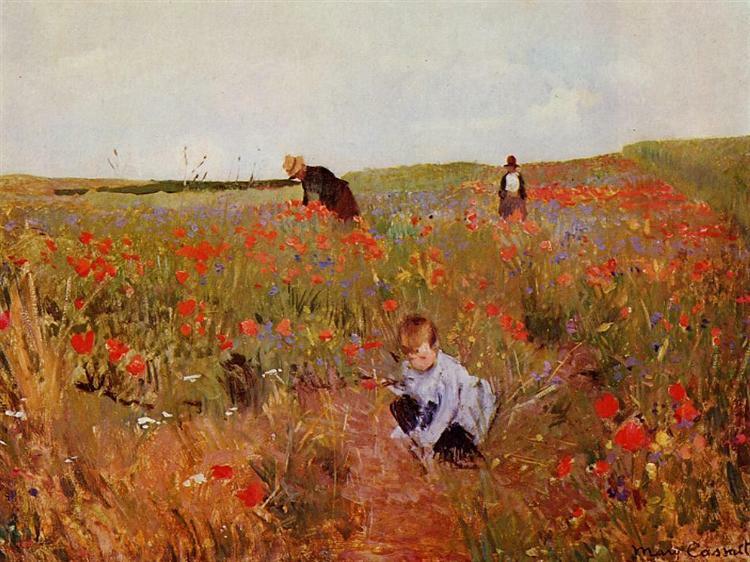 Whenever I see poppies, I think of ” In Flanders Fields”, the war poem written during the First World War. A beautiful homage to the poppy. It is certainly a flower which has caught our collective imagination. What a beautiful collection, Jane! I adore poppies but have only managed to grow some very anaemic-looking ones this year which pale in comparison to that wonderful Georgia painting.